If you are an adult or older teen with malocclusion (crooked teeth) that was never treated during childhood, Invisalign® clear aligners may be for you. If you would like your teeth straightened but would find metal braces embarrassing, Invisalign® aligners are clear so no one even needs to know you are straightening your teeth! If you are unfamiliar with Invisalign®, or have questions, check out our Invisalign® Q and A below. Question: What are clear aligners? Answer: Invisalign® clear aligners are similar to whitening trays that fit snugly over your teeth. They are made of a smooth, thin, comfortable plastic. Several sets of aligners will be custom fabricated according to the desired outcome of your treatment plan, and you will advance to a new set of aligners about every two weeks. Question: How can plastic aligners straighten your teeth? Answer: Metal braces consist of wires and brackets. The wires are tightened regularly to apply enough pressure to shift your teeth into their newly desired positions. This can be uncomfortable. 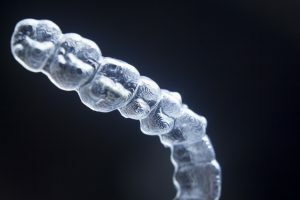 Invisalign® clear aligners are designed with a scientifically advanced plastic that puts enough gentle pressure on your teeth to gradually push them into their newly desired positions, as well, and Invisalign® aligners are not only more comfortable than traditional braces, and inconspicuous, but treatment is shorter. The desired outcome can often be attained in as little as 12 months. Question: What else should I know about Invisalign® aligners? Answer: Invisalign® aligners are removable. You will be required to wear them at least 22 hours each day, but you can take them out to eat (so you do not need to restrict your diet), and to perform your daily oral hygiene to keep your teeth clean and healthy.